Ronan Murray spent the early part of his career at Ipswich, Swindon and Notts County but now has the chance to win a historic double with Dundalk. 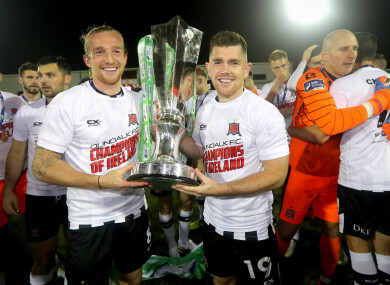 Murray (right) holds the SSE Airtricity League title at Oriel Park. RONAN MURRAY WAS blunt and outright when explaining his decision to leave Galway United at the end of 2017. The club had just been relegated, he was one of the most in-demand footballers in Ireland, and the striker had a serious hunger for silverware. Medals, cups, shields, massive nights in Europe, big crowds — he wanted it all. Moving to Dundalk seemed like the perfect match. Here was a club tearing at the bit following a 2017 campaign which left the Lilywhites empty-handed and Murray presented a player with that exact same desire to fill his cabinet with riches. As 2018 comes to a close with the Mayo man recently crowned a league winner, it is clearly a move which has paid dividends — Murray moved to Dundalk to win a Premier Division title, and he has done so. On Sunday the 27-year-old will have the chance to boost his return and secure a potential, historic double. Dundalk take on Cork City at the Aviva Stadium looking to avenge two successive defeats at Landsdowne Road, aiming to crown off a 2018 campaign where Stephen Kenny’s men have been the elite side in Irish football. John Caulfield’s Cork side claimed a historic league and cup double of their own this time 12 months ago, and Dundalk want to do the exact same this time around come Sunday lunchtime. It won’t be easy, Murray admits, but this position is exactly where he and the club wants to be. Competing for every trophy on offer, battling right to the final day of the season, always looking to outdo themselves, reach new heights and add another trophy to that packed cabinet down in Oriel Park. Rinse and repeat. He enjoyed an outstanding individual season in 2017. But it was a bittersweet, as Galway suffered relegation to the second tier. After a difficult first campaign back in the First Division where promotion slipped beyond reach, the Tribesmen will forge the tough and relentless battle to go up again next year. Murray scored 13 league goals last season and was quickly snapped up by Dundalk. Battling alongside Patrick Hoban up front, the player has found game time a bit trickier to come by this year. But from scrapping in a relegation battle to winning titles at the opposite end of the table, it’s been a complete turnaround, he says. “I suppose it’s two totally different kind of seasons. On an individual basis last year was great, but team-wise we got relegated — which was devastating. This year I haven’t played as many games as I would have wanted to, but we’ve won the league and it’s been a massive squad effort. “It hasn’t been just me that’s been missing out every week, the squad is just so strong. That’s why we’re winning the league and it’s why we’re in the FAI Cup final. We just need to enjoy it for what it is. We’ve won the league, which is great, it’s what I came here to do. Having turned out for local club Erris United in Ballina, the striker moved to Ipswich Town in 2007 after being spotted by Robin Turner, a former Ipswich player-turned-scout. The striker enjoyed both success and hardship during an injury-hit nine years in England. Murray got to a League Cup semi-final, a Checkatrade Trophy final and won a League Two title with Swindon Town, taking in spells with Torquay, Plymouth and Notts County. Arriving back in Mayo at the end of 2016, the player began working as a personal trainer, balancing his day-job with his footballing career with Galway at Eamonn Deacy Park. Moving to Dundalk offered Murray a chance to return to full-time football, and he admits that it’s been a switch he hasn’t look back on one bit. When I was watching over in England I was so proud of Dundalk and all they had done in Europe,” he says of their 2016 Europa League campaign. “It was phenomenal what they did and achieving all that success with that style of football too. Then when Dundalk came calling for me, it was a no-brainer to come here and experience what it’s like. “You couldn’t prepare yourself for how good it actually is. The lads are great and the team spirit is so high. Everyone digs in for each other and I’ve really enjoyed it. “Some players and managers can go through their career with no silverware at all. I was lucky to win a league in England in 2012 and to get to a final as well, but I thought them days would never come back. Murray says that he has been to the Aviva Stadium plenty of times as a spectator, but has never been fortunate to walk out onto the hallowed surface as a player. Sunday will see that aspiration become a reality, with a potential injury setback to Pat Hoban meaning a starting position could be on offer if Dundalk’s prolific forward does not recover in time. I hope Pat is ready for Sunday and I’m sure he will be,” Murray says. “It’s going to be a great day no matter who plays. It’s a squad effort and you just have to be ready to play. Hopefully I’ll get minutes out at the Aviva, which would be special. “I’ve never played there before, so it’s all a new experience for me. The lads have been telling me how big the pitch is and that I had better get my running shoes on,” Murray smiles. 🎥 HIGHLIGHTS: @GalwayUnitedFC 3-1 @LimerickFCie - Goal of the Season contender from Ronan Murray. “I suppose until you get out onto that pitch you’ve no idea what it’ll be like. You can envision it as much as you want, but you won’t know until you’re out there and get a feel for the ground. Walking out in front of big crowds is not a new experience for Murray, having played in front of 49,602 spectators at Wembley in the 2012 Checkatrade Trophy final, where his Swindon side suffered a 2-0 defeat at the hands of Chesterfield. I’ve played in front of big crowds before in England,” he says. “So I’ve got a little bit of experience with it. Once you’re out there on the field, it’s just you and you’re team-mates against the opposition. “The crowd is just background noise, to be honest. It doesn’t matter if there’s a man and his dog there or if it’s 30,000 fans at the Aviva, you just concentrate on what’s going on on the pitch. You just get in the zone and you forget about everything else. From suffering the pain of relegation with Galway to a potential double in the black and white of Dunalk, it’s been a transformative 12 months for Ronan Murray. He arrived in Louth wanting to be crowned a league champion and has achieved his dream on the first attempt. Sunday will present another first; walking out in front of tens of thousands at the national stadium on the biggest day in the Irish footballing calendar. Doubles don’t come around all that often, he points out, and the Mayo man knows he has the chance to be a part of history this weekend. Email “'I was lucky to win a league in England in 2012, but I thought them days would never come back'”. Feedback on “'I was lucky to win a league in England in 2012, but I thought them days would never come back'”.